See our huge range of free printable birthday party invitations and ideas for party themes. 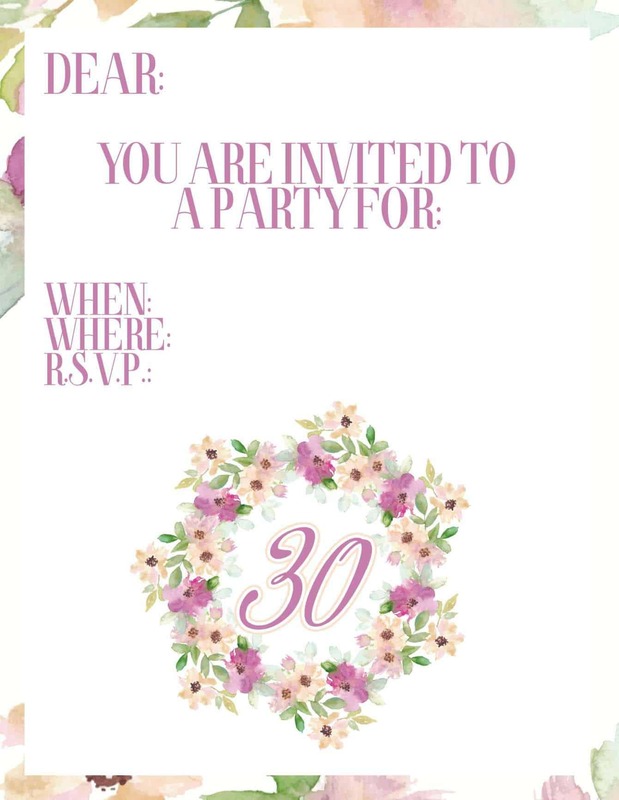 I have free printable invites for your 30th, 40th, 50th, 60th, 70th, 80th, 90th and even 100th so be sure to check out my full range.Whether its a human or animal birthday, we have got you covered with an absolutely massive range of invitations for any and every occasion! There is a lot of planning that goes into a birthday party. Choosing a theme (if any) organizing food, beverages and entertainment not to mention birthday invitations that match the theme or person whose party it is. Having access to a large range of free invitations is essential to keep costs down for planning your party. At all free invitations, we have just that, a massive range of invitations that you can use for any party or occasion, completely free! The 30th birthday is a wake up call for some and is a gratifying experience for others! The 30th birthday is a good milestone and one that needs to be celebrated no matter who you are. I suggest strongly that you celebrate this birthday as you are still young enough to party yourself silly and not feel like an old fool. The 30th birthday party need not be held as a house party. This one can be held in a nite club or restaurant. In this case, put the name of the establishment in the ‘Where’ space within the invitation. Be sure to put the address in there too so your friends and family know where to go. The 40th birthday is a huge milestone. By the age of 40 most people have settled down with a loved one and most have started a family, or are in the market for this life. Others have never grown up or simply prefer not to be attached. The 40th birthday symbolizes a point in life where you are neither young nor old and some say that life begins at 40. Either way, the 40th birthday party is an essential celebration that cannot be missed. Be sure to let your guests know a telephone number in the RSVP section of their invitation so that they can call if they are running late. The 50th birthday is a jovial celebration that is enjoyed by several generations. 50 year olds are feisty and young at heart. People seem to come into a wonderful zone once they reach 50. They have usually established themselves in their chosen career and are well on the way to a happy retirement It is for this reason that the 50th birthday party is extra special. 50th parties are usually held in a restaurant and a themed restaurant may be a good choice to ensure everybody is entertained. Do you know the best thing about reaching 60 years old? A lot! For many countries, you get the perks of being a senior citizen, like free movie days, discounts in establishments, and reserved parking spaces. It’s when the world starts pampering you, and why not? You’ve given it the first 59 years of your life. And now it’s time to celebrate your 60th birthday! It’s the start of things being all about you for a change. By the time you reach 70 years old, you may have inherited a lot already – wisdom, good wealth, nice pension, and a lot of freedom because if you had kids, they should have moved out by then. Basically, you’re onto a good thing. Now that calls for a celebration, don’t you think? With material possessions at your disposal, all you need to do now is enjoy and live life. Here’s to the best 70th birthday ever! There are a lot of quotes related to being 80 years old. George Burns once said, “By the time you’re eighty years old you’ve learned everything. You only have to remember it.” You’re like a walking encyclopedia! But if there’s one striking quote, it would be when Bonnidette Lantz said, “At 80 I hope to look back at my life and say, I have no regrets.” Let’s celebrate a momentous and satisfying 80th birthday! People say aged wine tastes the best. But when it reaches 90 years? It’s practically heaven on Earth! That is also the same for a person’s life. Reaching 90 is nothing short of a miracle, and every waking moment is always a great day to see the sun. You get to appreciate even the smallest things even more. 90 years old is no small feat, and it definitely deserves a grand celebration. And who’s with you? Your children, your grandchildren, and your grandchildren’s children! Sweet life indeed. I actually have a range of surprise party invitations. Be sure to check them out before making a choice although you are welcome to print out and use any invitations that you wish. 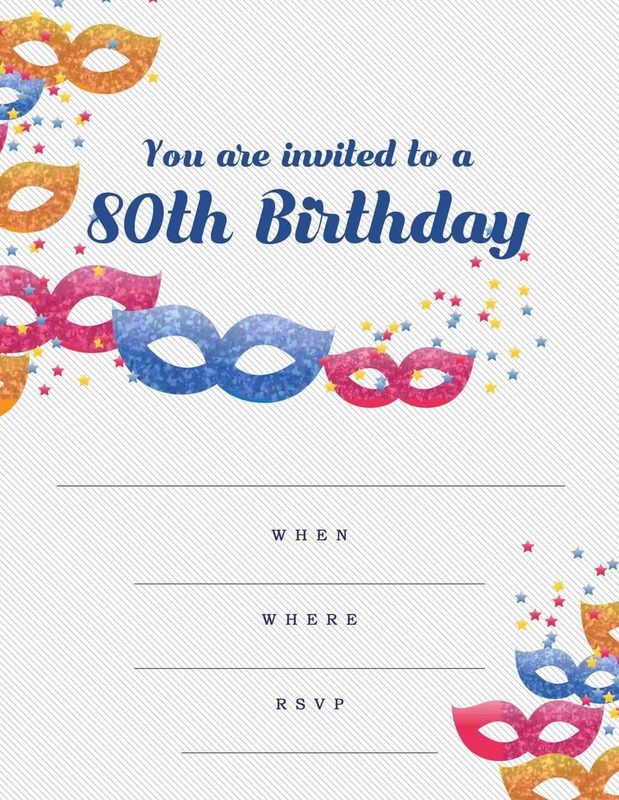 My site lets you download and print as many free invitations as you need for any occasion or celebration.